Here at Hirado Kohsyo Danemon Kiln, we cherish the exquisite intricacy of classic Mikawachi ware and its traditional techniques, including tooled-chrysanthemum appliquê work (kikka-kazari zaiku) and delicate blue decoration painted on the white porcelain prior to glazing, known as "underglaze blue" (sometsuke). Yet at the same time, we strive to create better products for our customers today. We re-evaluate all the beautiful designs handed down to us through the centuries by our predecessors at this kiln, select outstanding items that are also fully practical for today's world, and then tackle the task of bringing them to life once more. Here are some of the techniques we typically use. 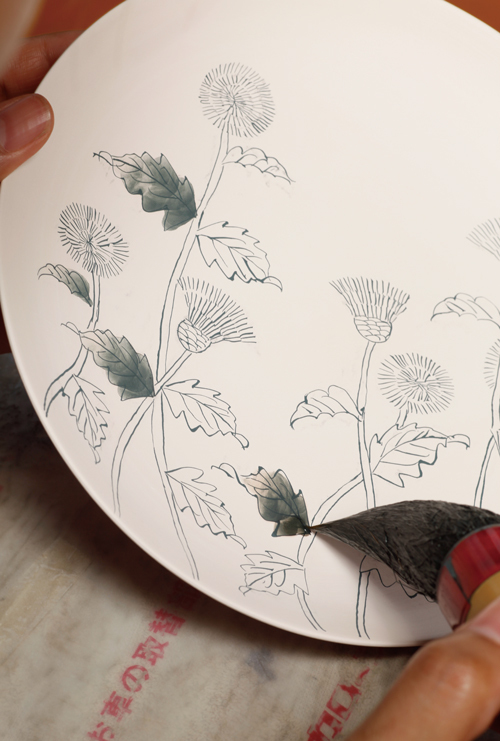 In this traditional technique, passed down the generations at our kiln, porcelain forms are decorated by adhering chrysanthemum flowers, leaves and other elements, each sculpted individually in porcelain clay. 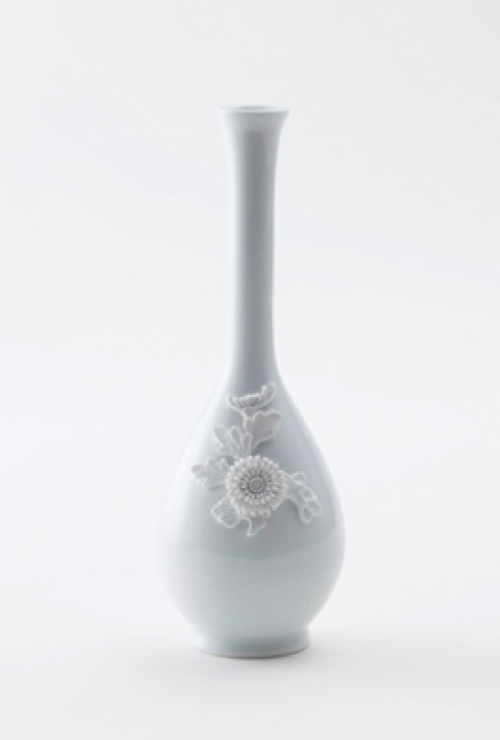 The flower elements are made by taking a lump of leather-hard porcelain clay and carefully carving out a round of petals using a sharp-pointed bamboo tool. When one round of petals is finished, the surface below is smoothed out, and another round of petals is sculpted around the previous one. This process is repeated several times. 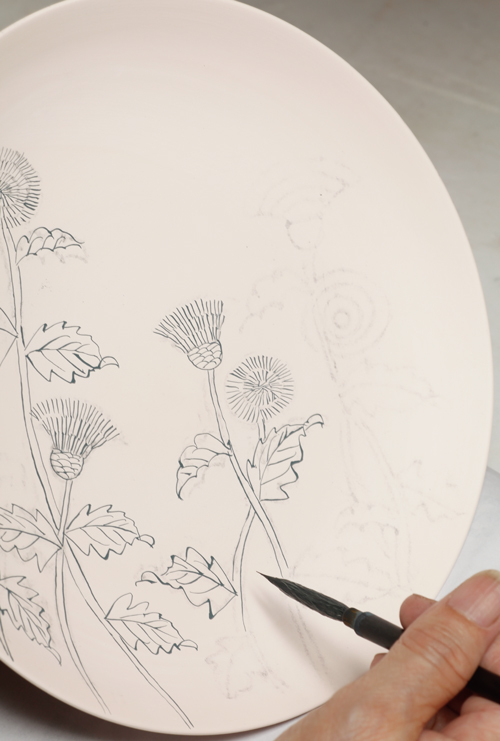 Finally, the excess clay is sliced off and the chrysanthemum is ready. Besides chrysanthemums, this technique is also used to craft cherry-blossoms and other seasonal flowers. 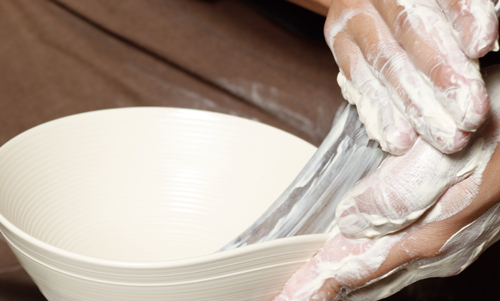 At our kiln, we make tableware, ornaments and other items by throwing the forms on a potter's wheel. These days we mainly use electric potter's wheels, but for carving, and for throwing forms destined for katauchi, for example, we also use an old-fashioned kick wheel. This is because the kick wheel can be stopped and started at will with one's own foot, which makes it more intuitive to use. 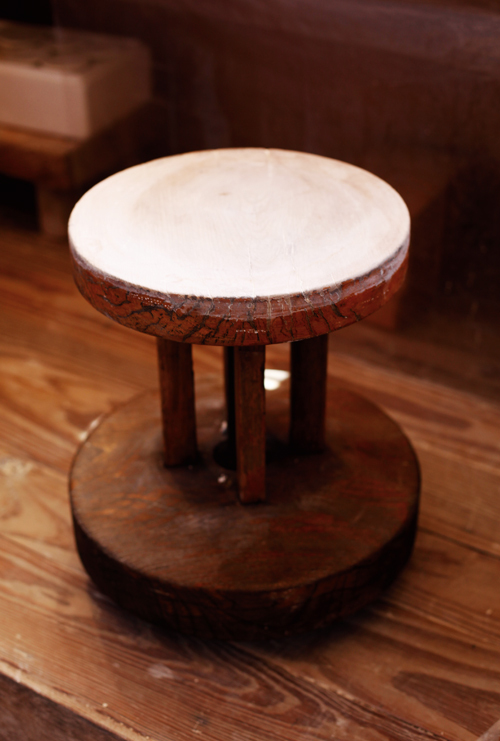 Katauchi is a technique whereby a thrown, leather-hard clay form is shaped by draping it on a plaster mould having a raised pattern, and then beating it onto the mould using a wooden paddle. 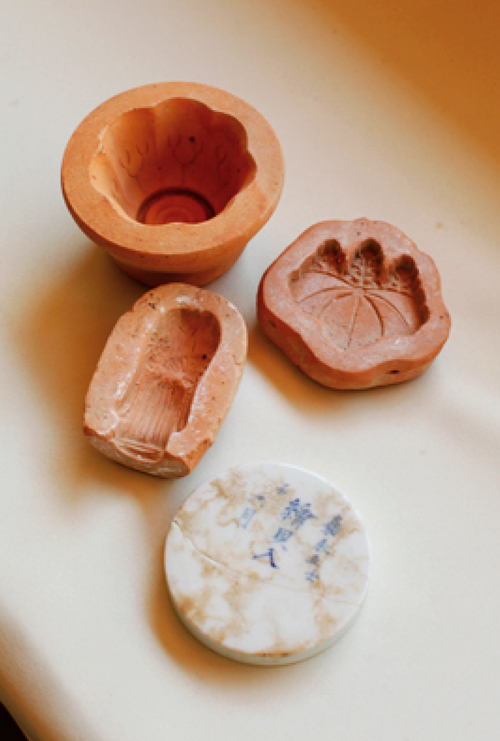 In the old days, the moulds were sometimes made of fired red clay and other materials besides plaster. 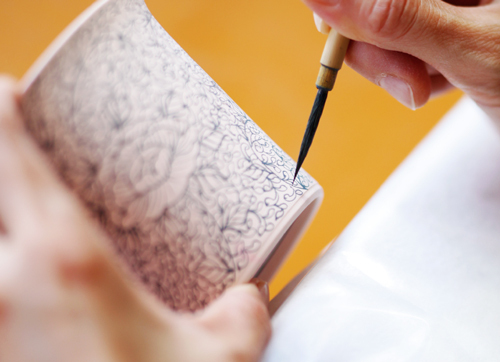 Sometsuke is a technique whereby designs or patterns are painted, using a brush charged with indigo-coloured paint or a cobalt pigment known as gosu, on unglazed porcelain clay that has been biscuit-fired, or in other words, given a preliminary firing at about 900°C. First, the outline of the design is painted, in a process known as etsuke. Next comes the process of dami, or filling in the outline. Dami is performed using a special brush known as a dami-fude. 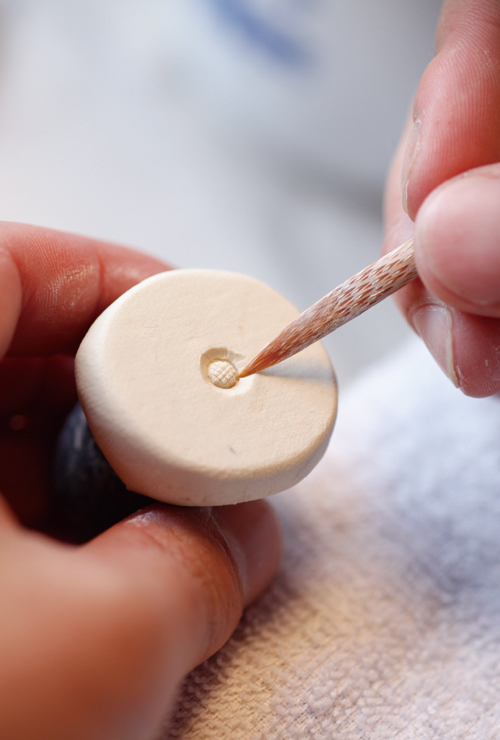 The brush is loaded with plenty of gosu pigment, and then applied to the surface of the item. The biscuit-ware thirstily drinks in the pigment, so outlineing and filling-in are much more difficult than they look. 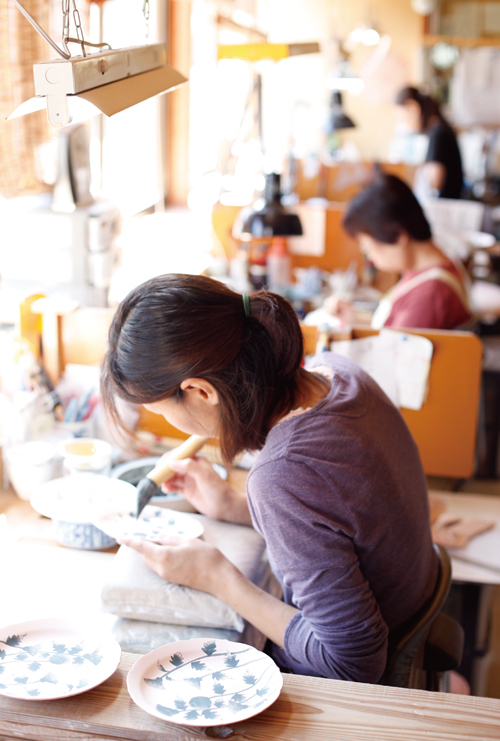 Our kiln uses a system whereby Kanyu and Yukimi Nakazato do the etsuke, and the dami is done by another artisan. Incidentally, the sometsuke category embraces a surprisingly broad range of styles, and there is considerable variation in etsuke and dami techniques between one locality and another. There are two types of firing: oxidation firing and reduction firing. At our kiln, we have two gas kilns and one electric kiln, which we use for different purposes. 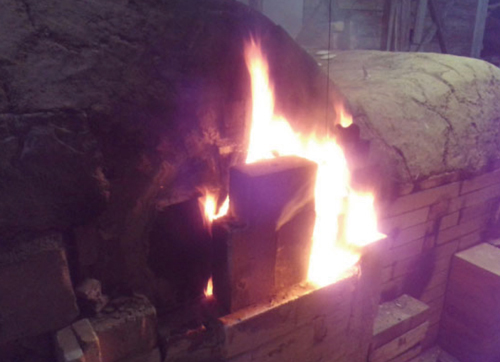 For biscuit firing we mainly use the electric kiln, because it is more suited to oxidation firing. For the main firing, we use the gas kilns, which are better able to attain the high temperatures needed for reduction firing. 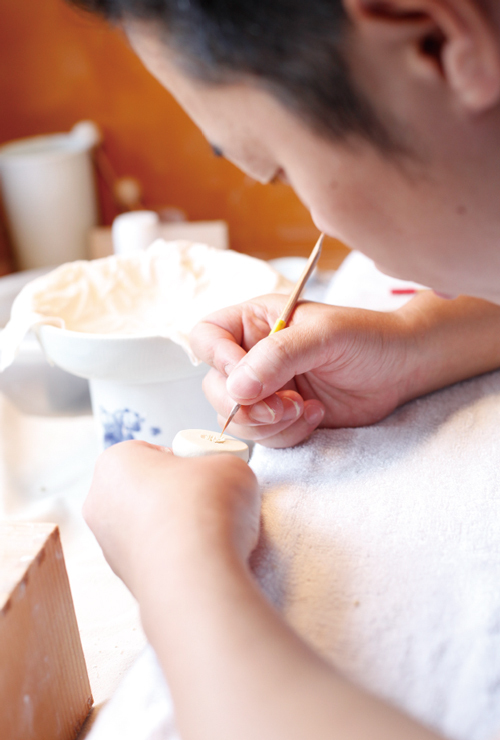 The porcelain clay we use, which is made by processing Amakusa pottery stone , only turns white on reduction firing. 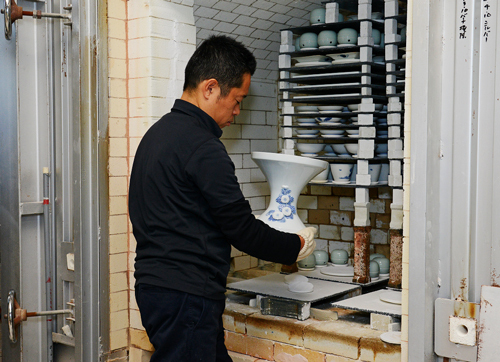 In reduction firing, the oxygen supply to the kiln chamber is restricted, so oxygen is drawn out of the glaze, which thereby loses its transparency and takes on a faint bluish tinge. 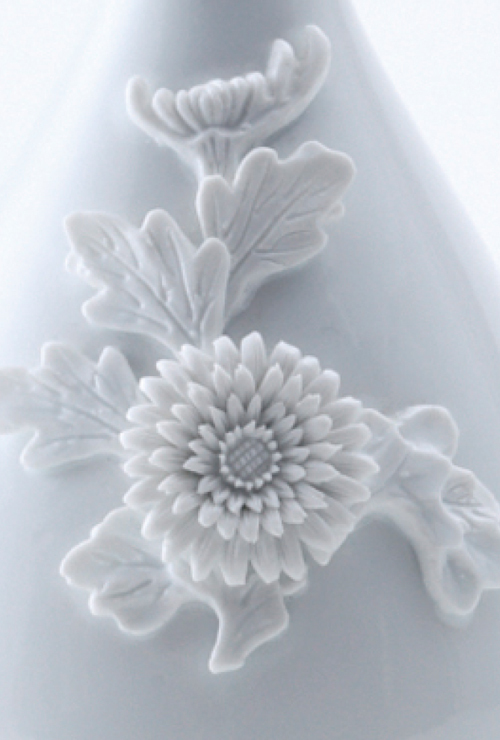 This gives the finished porcelain its characteristic blue-whiteness. When firing is carried out in a gas kiln, the temperature and gas flow is checked and adjusted every two hours or so, and the temperature reaches 1300°C over the course of about 15 hours. The kiln fire is then extinguished, and the interior is left to cool for a day. When firing is carried out in a climbing kiln or noborigama (a multi-chambered kiln typically built into sloping ground, with each successive chamber higher than the last), the fire has to be fed continuously with firewood by potters working in shifts. The kiln is stoked for two days or more, and needs even longer to cool down. 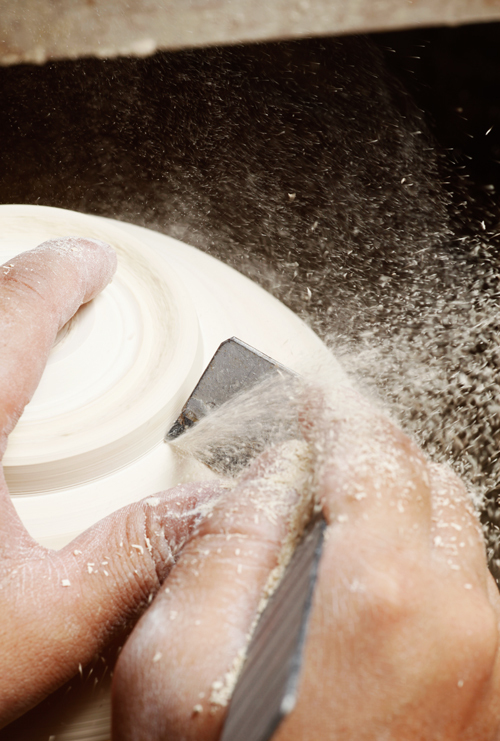 Gas kilns have better thermal efficiency than climbing kilns, and make it possible to achieve consistency in product quality, so porcelain-makers generally use gas kilns. 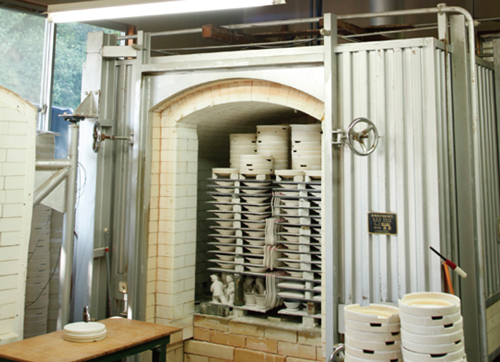 Nowadays, none of the kilns in Mikawachi use climbing kilns on a daily basis. However, the local kilns have joined forces to build a single shared climbing kiln which we use once a year for a collective firing. Noborigama (climbing-kiln) firings are unstable and do not always go according to calculations. 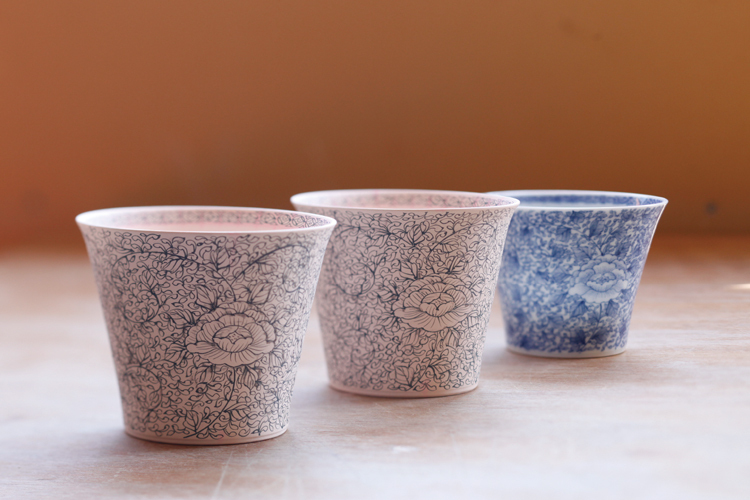 The process is very similar to that used by porcelain-makers of the Edo period (1603 to 1868), before gas and electric kilns had been invented, and the results are unpredictable. However, work successfully fired in this way has an inimitable finish somehow bespeaking the power of nature, and this magical quality cannot be achieved by any other firing method. Our own studio now stands on the site that, up until 1955, housed a climbing-kiln . Since then, the building has undergone several remodels, the most recent of which was completed in November 2001.